I have known Bonnie personally for some time now, and I have to say that Bonnie is a woman after the Lord's own heart, always full of joy and encouragement. Bonnie is part of an awesome ministry (which you can find out more about HERE), and she's even written a book called Excellence with Simple Elegance. This book is a beautiful teaching and testimony to how we as women can live a life bursting with faith and with excitement for God and his plans. Read on to hear more about Bonnie's testimony and how you could win a copy of her book! Bonnie says that intentional living is the key to experiencing the abundant life that God desires for us. "Take the vision, write it down, make it plain so you can run with it." Habakkuk 2:2 The goal of running a half marathon was 'out of my comfort zone'. Before my training began for this half marathon, I had never ran more than a 3 miles at one time. And I was not a runner until 10 years ago at age 50! 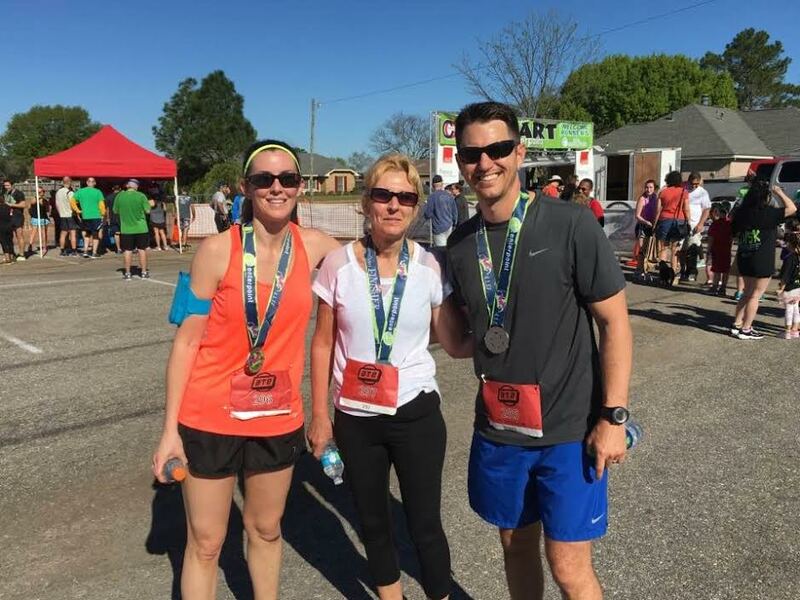 But, on April 1, 2017, I ran my first half marathon with my son and daughter-in-law who were my accountability partners and motivators throughout the race and training up to it. I ended up finishing in second place in my age group (60-64) - God rewarded me way beyond what I could ever imagine just because I did my part! "By no means do I count myself an expert in all of this, but I've got my eye on the Goal, where God is beckoning us onward... I am off and running, and I am not turning back"
Bonnie's story just goes to show us that, really, anything is possible! She set a goal and made a workable plan and kept to it. If you want to move to a healthier place, you need achievable goals, and, most importantly, a plan. Did you know if you write down your goal and your plan you increase your success rate? So, here's what we want you to do. Comment on this post and share your health goal for this week: specifically what you will do to reach that goal (don't say eat better or exercise more - be specific. Ex: I will eat no more than 24 grams of added sugar each day and I will exercise 3 times/week for 30 minutes....) Share your goal and plan here or on our facebook page before the end of the day on Thursday (4/6/2017) and you will be entered to win one of Bonnie's books "Excellence in Simple Elegance" (we'll be giving 10 books away!). THEN we will check back in with you in one week. If you reached your goal for the week you can respond to that post and be entered into a drawing to win a $50 Faithful Workouts' gift certificate! In the process of making goals and plans, we really encourage you all to find a partner who will hold you accountable. This can mean they text you and check in everyday, or maybe you set up a time to chat with them at the end of the week and let them know how things are going. It's easier to find an accountability partner in this context because it's not a long term commitment, but if you find someone who's willing to stick it out with you throughout your health journey, then that's even better! Jesus didn't walk out his calling alone, and we shouldn't either! Thanks for taking time to hear some of Bonnie's story, and we hope you join in with us and commit yourself to taking this next step toward healthier living!